We don’t require that our kids choose a college based on the fact that it’s located in a destination with phenomenal wine and food. Really, we don’t. We’ve just gotten exceptionally lucky so far. Our eldest, The Daughter, is in school in New York City. Regular readers will recall our previous posts about adventures there. (Fathers, Daughters and Old Ghosts and Prosecco, Zin and NYC— With a Twist of Literature) Needless to say, you don’t have to search very hard in Manhattan for great dining experiences. We’ll barely scratch the surface during her years as student in the city. Now, we’re getting ready to send our middle kid, The Boy, out into the world. He has chosen an institution of higher learning located in Santa Barbara, California. Everyone has seen Sideways, of course, and understands our excitement, I’m sure. For years, we have been meaning to visit the California Central Coast—with its many incredible wineries— and now we have not just an opportunity, but an obligation to go there repeatedly over the next four years. Hallelujah! Rest assured, when we need respite from all our giddy excitement, we just look at the tuition bills and that brings us right back down to earth. Recently, we accompanied The Boy to his freshman orientation, as it promised some helpful briefing sessions for parents, as well. And let’s not kid ourselves, we really just couldn’t pass up the excuse to go to Santa Barbara in the summer. When booking accommodations for any trip, I am always one to scour the internet to read reviews and find not only a great hotel, but a great deal, as well. It’s like a treasure hunt for me. Yet, given that our mission on this trip was to become oriented parents, I assumed we’d perch ourselves at the local Marriott Courtyard, as is often our habit. But…I happened to stumble upon a phenomenal rate at a full service resort nearby and that changed everything. Bacara Resort & Spa looked beautiful on it’s website, but I’ve certainly been disappointed before by advertising that is better than the reality. This was most definitely not the case with Bacara. 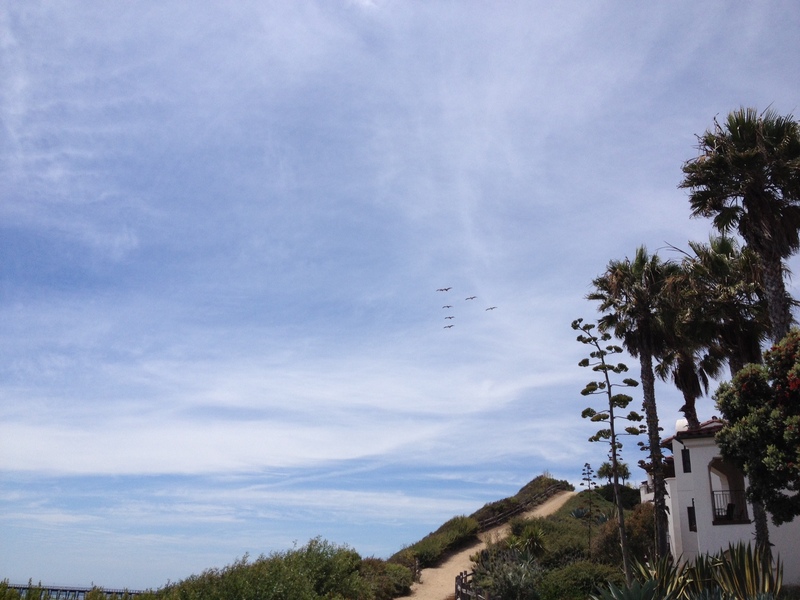 In fact, I’d say that with Bacara, photographs hardly do justice to the real thing. Nestled into a hillside above the Pacific Ocean, the resort stretches endlessly over the hills and down to its own beach, with accommodations spread out amongst numerous villas. With several pools, a spa, several restaurants and even a wine tasting room on site, it could run the risk of feeling large and impersonal. However, Bacara’s impeccable service gives it a warmth and charm more akin to an intimate, smaller hotel. Little did I realize when I booked our room that Bacara has been Oprah’s stomping grounds, as well. She hosted her Legends Ball there in 2005 and was there again earlier this summer taping an episode of her Next Chapter series. Like we always say, if it’s good enough for Oprah, it’s good enough for us. For our tasting, we opted for the “Foley Dream Flight” (how could we not? ), which that evening consisted of wines from Lincourt, Firestone and Three Rivers Winery in Horse Haven Hills, Washington. Our favorite of the tasting was the Lincourt 2011 Steel Chardonnay, thus named because it is aged in stainless steel instead of oak. We tasted crisp apple, with a bit of lemon, and yet also a soft hint of sweetness that we don’t often find in wines aged in steel. A palate pleaser, it retails for $18 from the winery and less at some internet sites. Wine & Spirits, by the way, rated it a 92 and called it a “steal.” We agree. 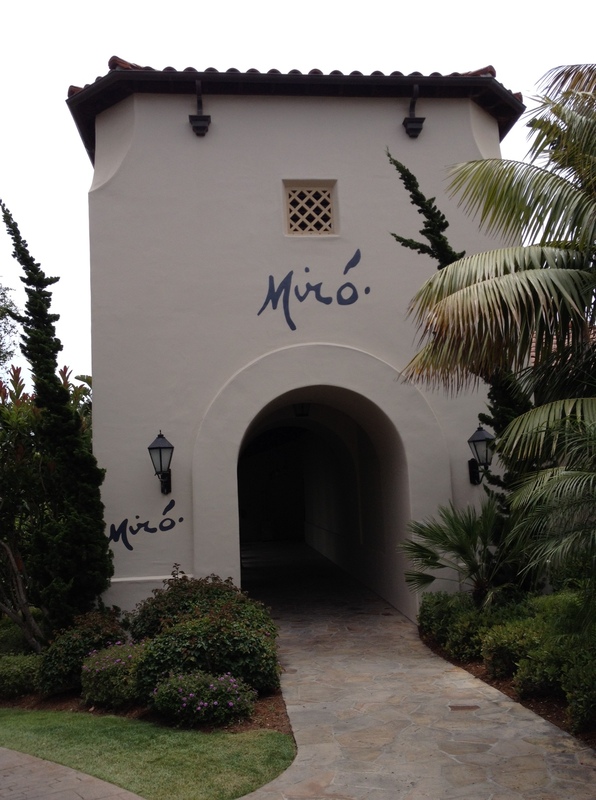 As if this wasn’t enough fun already, next we strolled down the hill to Bacara’s premier restaurant, Miró, which features contemporary cuisine with French and Italian influences and a drop-dead gorgeous view of the Pacific. With 12,000 wines in their collection, featuring 1,200 different labels, we knew right away we’d call on the Sommelier for help. Todd graciously came to rescue us from indecision. 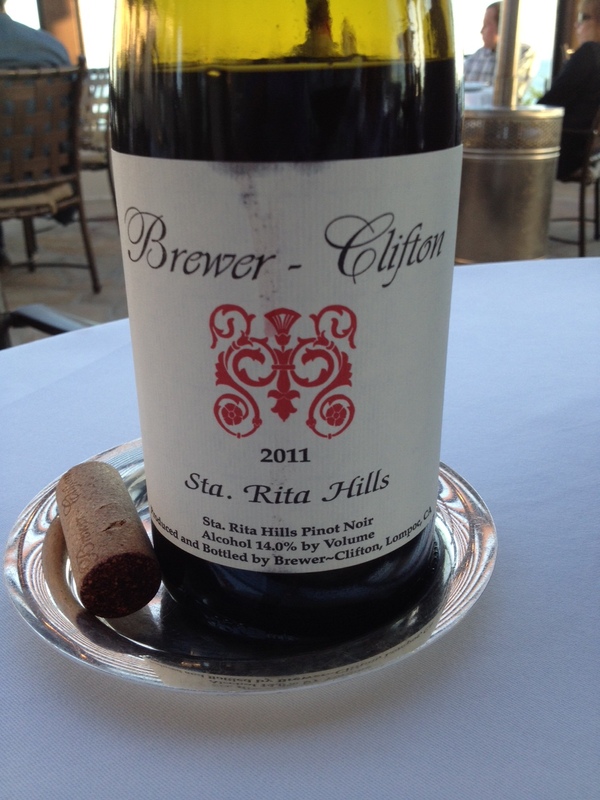 With his wholehearted endorsement, we decided to try the Brewer-Clifton 2011 Santa Rita Hills Pinot Noir. Every wine we considered had a great story and great pedigree, but the deciding factor in favor of Brewer-Clifton was that we had exchanged tweets with them just the day before and they seemed like very friendly, down-to-earth people. Everyone knows that wine tastes better if it is made by friendly people. The 2011 Santa Rita Hills Pinot certainly showed us why they receive such rave reviews. It had a lovely European restraint, with elegant flavors of dried cherries and a hint of spice. It was an excellent accompaniment to everything we ordered, from the chilled corn soup with lobster, to the heart of palm salad, to the Wagyu rib eye steak, to the black pepper tagliatelle. The entire meal from start to finish— food to wine to presentation to service to ambience— was quite honestly one of our top dining experiences ever. Our goal now is to return here as many times as our pocket book permits over the course of The Boy’s four years studying in the vicinity. So this week, we raise our glasses to all the folks who helped make our parent orientation so lovely— to every single member of the impeccable staff at Bacara Resort, to Ashley who poured for us at the on-site wine tasting room, to sommelier Todd and the phenomenal staff at Miró, and to the crew at Brewer-Clifton whose wine graced our dinner table. While we may not have had perfect attendance at all the official parent orientation events, we like to think that a happy parent is a well oriented parent. That’s our story, and we’re sticking to it. We agree with your views on the kids and college. Our 1st went to Boston, always fun. #2 chose Walla Walla, Wa. He got tired of seeing us for “parents weekend”! LOL, Jeff. Glad you can relate. Yes, we’re pretty sure we’re going to wear out our welcome with our son in Santa Barbara in no time at all! Cheers!